Update: 25 Safar 1433H / 19 Jan 2012M, Khamis. With a new laptop (mentioned in this post: How to solve Flash problems on Ubuntu 11.10 Oneiric Ocelot) and Ubuntu 11.10 freshly setup, problems are bound to appear frequently at the beginning. Pic 1 - The [ViewPDF] failed to start error. Checking Kile in Ubuntu Software Center as seen in Pic 2, i had every add-ons marked except for one that i definitely don't need and isn't the cause for this error. So if everything is there, then why the error? Pic 2 - Kile add-ons in Ubuntu Software Center. Another check in Ubuntu Software Center for Okular, turns out that it wasn't installed along with Kile; each package had to be installed individually. By now, you can guess how to solve this problem. 2. 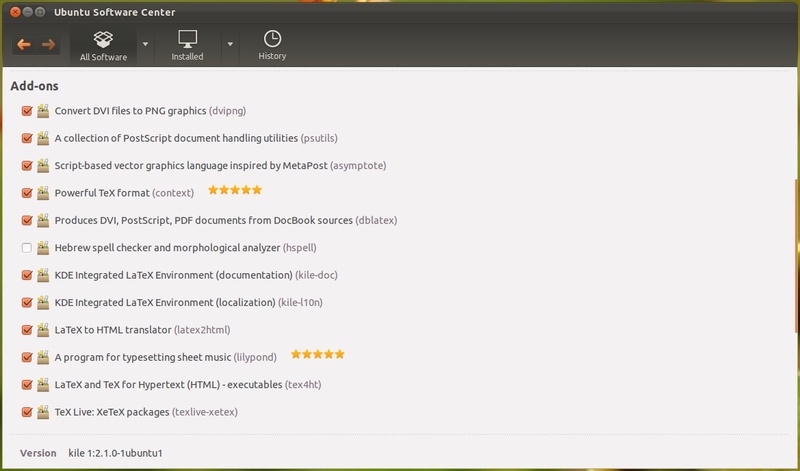 In the Ubuntu Software Center window, type the search term okular in the search field. The search results will be auto-filtered as seen in Pic 3. 3. In the search results, click on the Okular (okular) package. A More Info button and Install button will appear below the package's name, see Pic 3. If you want to add add-ons, click the More Info button. From here, go to Step 4. If you don't need any add-ons or straightaway want to install the package, click the Install button. From here, go to Step 6. Pic 3 - Refer Step 3. Okular search results. 4. Tick the add-ons you need or untick the add-ons you do not need. Then click the Apply Changes button. See Pic 4. Pic 4 - Refer Step 4. 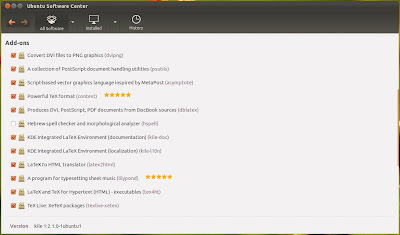 Okular add-ons in Ubuntu Software Center. 5. After changes have been applied, click the Install button, see Pic 5. Pic 5 - Refer Step 5. 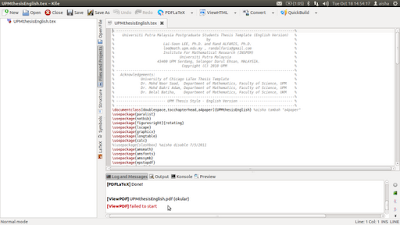 Installing Okular with add-ons via Ubuntu Software Center. 6. An Authenticate window will appear prompting for your password. Key-in your password then click the Authenticate button. See Pic 6. Pic 6 - Refer Step 6. Authenticating the installation action. 7. Once installation is complete, the Install button (see Pic 5) will turn into the Remove button, see Pic 7. Pic 7 - Refer Step 7. The Install button is now the Remove button. 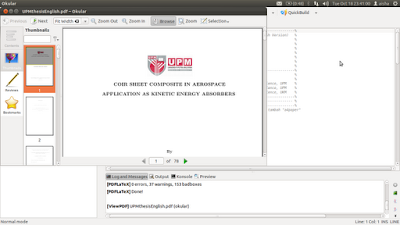 Try recompiling your document in Kile. My problem went away by now. See Pic 8. Pic 8 - Refer Step 7. Everything is working great now. Kile is in the background window, Okular is in the foreground window. Thank you for posting this, it really helped me out. thanks, now it works perfectly. Ever thought of changing the ViewPDF option to evince in settings?? Thanks so much!!! I had the same problem, but now it's solved thanks to you! Solved my problem. Thanks dude.